Marco Polo’s claim to have imported the pasta concept from China is pretty much sauced with ego. For thousands of years, flour, water, salt and ingenuity have made pasta-like foods for the poor. In the first century BCE, Horace wrote of proto-lasagna, fried sheets of dough. The Jerusalem Talmud celebrates itrium, a boiled dough made in the Holy Land after the 3rd century ACE. 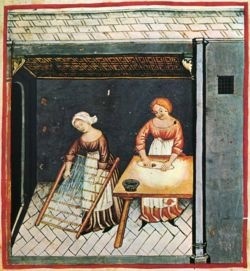 The illustration shows a 15th C Latin translation of an Arabic text, showing women making long pasta. As you see, it’s labor intensive. A solitary cook with a hungry family put hours into pasta-making. Culinary technology crept along. Three centuries later, the great technician Thomas Jefferson drew a mechanism for making macaroni, which you see here. 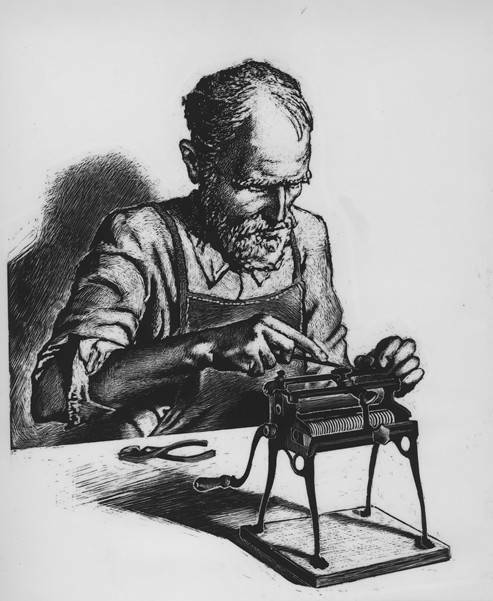 Somewhat later (1906) in Cleveland, Italian immigrant Angelo Vitantonio invented the first hand crank pasta machine, cheap and easy to use in the home. Pasta no longer needed to be flattened and cut by hand, allowing a single cook to quickly produce large quantities of uniform pasta. From the Holy Land to Cleve-Land, pasta endures. Shapes change, sauces change, but flour, water, salt, sometimes a few other additives, and cooks’ ingenuity keep abundantly satisfying families.